Split level 3 bedroom that is bound to please you - 2 full baths; Queen size bed in I bedroom & 2 singles in 2nd and two cot size beds in the 3rd. Queen hide-abed in the carpeted living room and fireplace. Windows galore! 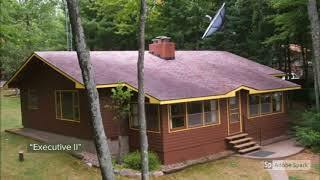 A beautiful location in the pines overlooking the lake & level sandy beach. Extra length dock. Price includes a large pontoon boat w/ electric start motor. Located on Cranberry Lake. 7 Mainland Villas, 13 Island Villas, Carraige House & Hillcrest House. On Cranberry Lake (part of the longest chain of lakes in the world - 28 connected, navigable lakes). Your own private pier & beach. An individual house (villa) - no common walls. Spacious grounds, Pine and wildlife! Golf courses nearby - go by car or boat. Restaurants to "boat to." Tennis, volleyball, horseshoe court, game room, kiddie playground, sauna, in-room whirlpool. Fishing, sail boating, skiing, canoeing, tennis, bicycling, or playing shuffleboard, etc. - available right on the premises. Centrally located recreation room, exercise room and sauna. Nearby Zoo, winery, horseback riding, bingo, Snowmobile Derby, Klondike Days, Cranberry Fest, Musky Tournaments, more! Nightly rates are based on a 3 night stay. Rentals start any day of week. Low rates are for off season and higher rates are for summer months. **Also available for monthly rental.